Running another train or two! Well after a little break it’s time for another post. Despite a busy bank holiday weekend of decorating, swimming, church etc there was just time to do some more running in of trains. It’s been a while since the last running in of a train, however the circle of track was still in place in the loft, so it was a simple task to do. Today’s turn was the Bachmann Class 220 model. 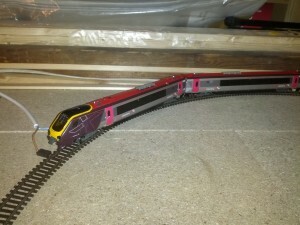 I bought this as I like the look of them, and while a tilting Pendolino is of interest in the future – the fact that this model as the generic cross country livery and not the Virgin one made it a preferred choice. The photo here shows one of the cabs and the powered coach running round the circle of track. I didn’t get the whole train out – I’ll save that for when I have a full layout to run it on, however I did want to do more than just get out the powered coach and run that hence the cab unit. The other train I got out today was a slightly impulse buy off ebay and it was a good chance to see how it would work. It was an article mentioning it was the 70th birthday of Thomas the Tank Engine that made me have a look at the models available these days. It appears that the rights have moved from Hornby who traditionally made the Thomas models, and Bachmann are about to start making some instead. The projected prices of the Bachmann models do not look cheap, so I started having a quick flick through ebay to see what was there. Now while Thomas and friends are not the trains I plan to be running as standard on my railway, as we do however have a little person in the house who is likely to get introduced to the stories in the not too distant future. 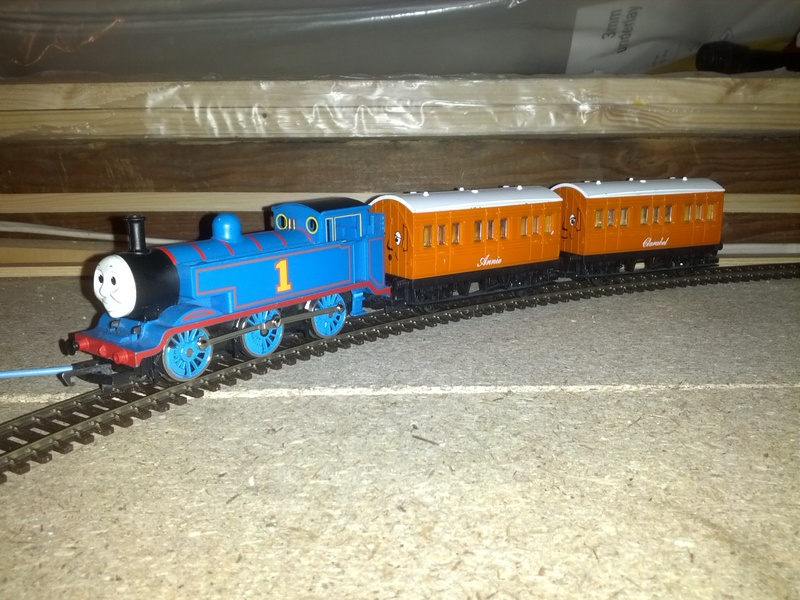 So when I came across a Thomas and carriages for a mere £20 I decided it was worth it and tuck it away in the loft for a couple of years. 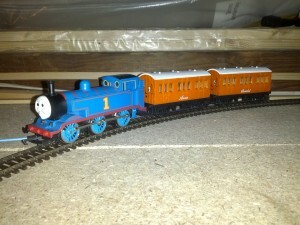 The photo below shows Thomas with Annie and Clarabell on the test track. I was impressed with how well Thomas ran, particularly at both high and slow speed. This entry was posted in Model Railway and tagged 2015, Class 220, DC, Model Railway, Running in, Thomas, Trains by John. Bookmark the permalink.